An ORC Superaycht certificate comes in two A4 pages. First page contains most of the measurements as well as scoring options with ratings provided for different wind and sea state conditions, Second page is reserved for all the inventories of sails, tanks, anchors & chains and other items recoreded to be on board while racing. 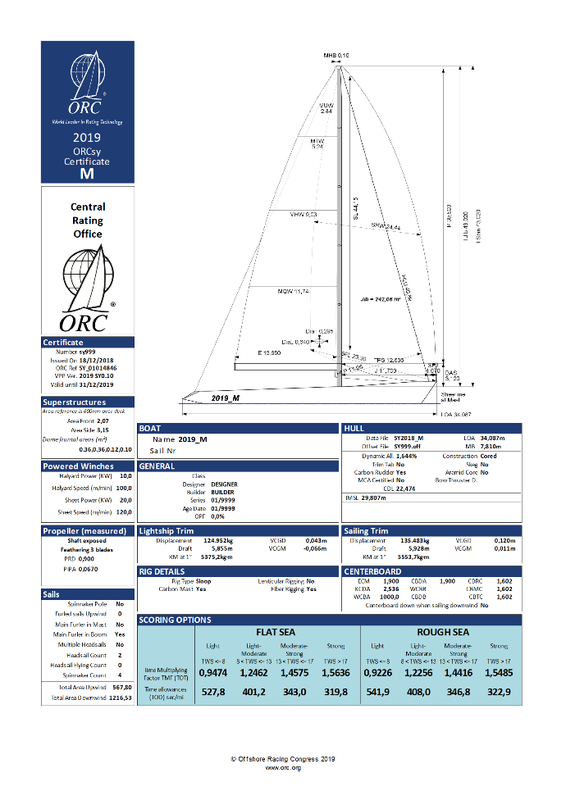 For details of the meaning of the measurement abbreviations, consult the International Measurement System (IMS) and ORC Superyacht Rule available at Rules page. Place the cursor over different parts of the certificate page for brief explanation. The rig configuration details vary with the input. Thus, the spreaders diagrammed match the spreader count, the standing rigging matches adjustable stays recorded, jumper or inner forestay are shown if recorded and split rigs are shown with a mizzen together with appropriate dimensions. A bow sprit is shown if the jib can be tacked forward of the stem. The transom geometry will represent actual boat's transom in various types from default reverse transom to the options with outboard rudder. Asymmetrical spinnakers are shown according to the type declared for the yacht; i.e., the type which the rule requires to be tacked on the yacht’s centerline (with no pole aboard) or else the type of asymmetrical which may be tacked on a spinnaker pole aboard the yacht. Rated sail areas are printed on each sail. A cruising-type main or jib furler/reefer is displayed if fitted. The yacht's name and sail number. Information about the type, designer, builder, date of the first launch of any sistership and date of launch of this yacht are shown here, along with any Observed Performance Factor credit (%) to the rating (OPF). Propeller data includes type of propeller (solid, folding or feathering) and propeller installation (in aperture, strut drive or shaft) followed by propeller diameter PRD and propeller installation projected area PIPA. Information about the principal dimensions of the vessel are shown here, along with the file names used to calculate the rating, construction details, MCA certification, the diameter of the bow thruster(s) open tunnel, the Dynamic Allowance based on the DSPL, DLR and the SA/DSPL, Draft/L factors, existence of a Trim tab or carbon rudder and the Class Division Length (CDL). Centerboard is measured separately from the offset files with set of measurements defining its size and moving range. The yacht's rating in Time on Time (ToT) and Time on Distance (ToD) scoring methods are are shown here as generated by the ORCsy VPP for Flat and Rough seas, in Light (TWS <= 8 knots), Light-Moderate (8 < TWS <= 13 knots), Moderate-Strong (13 < TWS <= 17 knots) and Strong (TWS >17 knots). The rating used in a race is at the discretion of the Race Managers. All ORCsy certificates are issued by a team on the ORC Tech Staff that is dedicated to rating Superyachts. b) adding the weights that are declared to be on board while racing but were not on the boat during the measurement. Certificate number is used for the ORC Rating Office administration, while ORC Reference number is a unique number identifying that certificate and may be retrieved in the ORC database available at the ORC Sailor Services. The version of the ORC Superyacht VPP used to generate the ratings, and the expiry date are all shown here. There is an issue date as well as a VPP version used together with the latest date for the validity of the certificate. The size of the vessel’s superstructure above a line 600 mm over the deck level in square meters and any communication dome(s) frontal area is shown here. The principal characteristics of the spar(s) and standing rigging are shown here, along with the material of mast and rigging. Total sail areas in square meters is shown for upwind and downwind sail configurations..
For non-manual powered sheeting and halyard whinches, max. power in kW and max. speed in meters/minute is shown. Main hydrostatic characteristics such as displacement, draft, vertical center of gravity an righting moment are given for the Lightship Trim (completely empty yacht). Main hydrostatic characteristics such as displacement, draft, vertical center of gravity an righting moment are given for the Sailing Trim (close to the actual condition in which the yacht is racing).